The New Haven Independent looks back at the Blizzard of 1888 which dumped 45 inches of snow on the city. 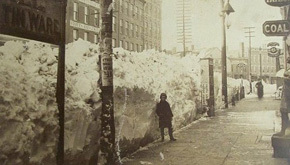 Their article illustrates, with photos from the New Haven Museum, the fact that the sidewalks in Downtown New Haven were cleared first after that storm; highlighting the transportation priorities of then versus today. I find it interesting just on my street alone I had to file a ProvConnex complaint. I had photos – linked them in the complaint. Asked them to contact me. If the snow isn’t cleared from the fronts of the sidewalks on Knight Street by Friday I’m going to call the people at ProJo. I think it might be an interesting story. I sent a number of reports through the Provconnex website too, and it was ONLY because of the snow the other night (parking ban, my foot! If you can’t do it right the third time…) that my street was re-plowed. I have a neighbor that flatly refused to shovel their corner lot, though their Mercedes was immaculately shoveled out. I sent two complaints in, and it was finally handled. I’m not sure either Provconnex or SeeClickFix do much good where shoveling and plowing are concerned.